Dogs are allowed but only after confirming with us please. Dogs must be kept off the furniture and remain out of the bedrooms. Also please ensure that you clean up after them, as the guest following you may not be dog owners and may have children. Food and water bowls for dogs are provided along with separate dog towels. Positioned along a private water board road, accessing the north side of Loch Katrine, this location really gets you away from the hustle and bustle of every day life. The cottage has original thick stone walls and a slate roof. The interior has been beautifully appointed with attention to all details. There is hard wood flooring in the main living area, with carpet in the bedroom and the shower room is fully tiled. The open plan living area makes for an ideal space to relax together. The lounge has a brown leather sofa and a wall mounted flat screen TV/DVD with freesat. WiFi connection means you can have a working holiday if you wish. The bedroom is beautifully co-ordinated with a leather bed. The cottage has a private patio area outside and shared courtyard with ample parking. 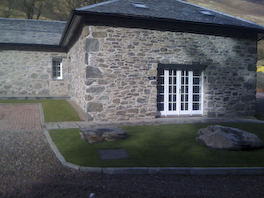 There is open access onto the hillside behind the cottage and it is only a short stroll down to the loch side. The surrounding area is picturesque and the scenery is wonderful throughout the seasons. Loch Katrine is surrounded by wonderful wild countryside to explore, with mountains such as Ben Venue, Ben Ledi and the smaller Ben A' all within easy reach. At Inversnaid take a cruise on Loch Lomond or walk some of the West Highland Way. The Trossachs is an amazing location for outdoor enthusiasts as there are endless miles of forest roads and trails to explore, both walking and cycling. There is an abundance of wildlife to spot: birds of prey, red squirrels, pine martens and red deer to name a few. In the surrounding area there are many activities for every age and interest. At Aberfoyle, for the adventurous, is a high wire forest experience with the longest zip wire in Britain. Aberfoyle has an 18-hole golf course and there are numerous lochs to fish in. From this central location you can easily travel and explore the National Park, Stirlingshire and Perthshire. This is an idyllic setting for a holiday away from it all, to enjoy the remote countryside and outdoor pursuits or as a base to explore further afield. Ground Floor Property is heated by electric wet system and comprises: Open plan Lounge/kitchen/dining area: Lounge Area: With satellite TV and DVD with patio doors providing lovely countryside views. Kitchen Area: With electric oven and hob, microwave, fridge with ice box and washer/dryer Shower Room: With large shower enclosure, WC and wash basin First Floor Bedroom: With double bed and coombed ceilings with velux windows Facilites All power, bed linen and towels included. Communal pay phone available within the courtyard. Wi-fi available. Cot and high chair available by request Patio doors leading out to outdoor seating at side of cottage. BBQ (coals not supplied). Ramp access from parking area into lounge. Shared courtyard Private water supply. Off road parking for 2 cars. From £270 per week low season to £400 per week peak season - check for late deals.